This assay has high sensitivity and excellent specificity for detection of human GDF11. No significant cross-reactivity or interference between human GDF11 and analogues was observed. MBS939778 is a ready-to-use microwell, strip plate ELISA (enzyme-linked immunosorbent assay) Kit for analyzing the presence of the growth differentiation factor 11 (GDF11) ELISA Kit target analytes in biological samples. 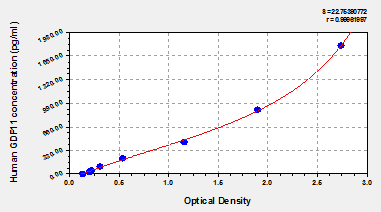 The concentration gradients of the kit standards or positive controls render a theoretical kit detection range in biological research samples containing GDF11. The ELISA analytical biochemical technique of the MBS939778 kit is based on GDF11 antibody-GDF11 antigen interactions (immunosorbency) and an HRP colorimetric detection system to detect GDF11 antigen targets in samples. The ELISA Kit is designed to detect native, not recombinant, GDF11. Appropriate sample types may include undiluted body fluids and/or tissue homogenates, secretions. Quality control assays assessing reproducibility identified the intra-assay CV (%) and inter-assay CV(%). Intended use of this ELISA kit is quantitative detection of human growth differentiation factor 11 (GDF11) in serum, plasma, and tissue homogenates. GDF11s alternative name in NCBI and UniProt data bases is bone morphogenetic protein 11 (BMP11). GDF11 belongs to family of bone morphogenetic proteins which regulate cell growth and differentiation in embryonic and adult tissues. GDF11 test kit is designed as sandwich-type ELISA and concentration of GDF11 is measured using pair of antibodies specific to target protein. Product contains microwell plate pre-coated with capture antibodies against GDF11, and all reagents required for its quantification, including sample and reagent diluents, and wash solution. Assay kit provides colorimetric detection of GDF11 using biotinylated detector antibodies against GDF11, avidin conjugated to HRP, and TMB as its substrate solution. Minimal detectable concentration of ELISA kit is 7.0pg/mL and its reportable range is 28-1800pg/mL; concentrated calibrators preparation for standard curve is supplied in lyophilized form and requires dilution for making working levels of calibrators. Intra- and inter- assay CV values, reported as kits precision characteristics, are not greater than 8% and 10%, respectively. Assay doesnt show significant cross-reactivity with analogous molecules. ELISA kit and its reagents and components require refrigeration and must be stored at 2-8°C until indicated expiration date. Principle of the Assay: This assay employs the quantitative sandwich enzyme immunoassay technique. Antibody specific for GDF11 has been pre-coated onto a microplate. Standards and samples are pipetted into the wells and any GDF11 present is bound by the immobilized antibody. After removing any unbound substances, a biotin-conjugated antibody specific for GDF11 is added to the wells. After washing, avidin conjugated Horseradish Peroxidase (HRP) is added to the wells. Following a wash to remove any unbound avidin-enzyme reagent, a substrate solution is added to the wells and color develops in proportion to the amount of GDF11 bound in the initial step. The color development is stopped and the intensity of the color is measured.